The original TT in crossover form. With Audi yet to decide on whether there is a future for the Tourist Trophy, maybe turning it into a crossover can save the TT. As this concept shows, the interesting idea of a high-riding TT is nearly 20 years old. Could it be a crossover? Maybe. 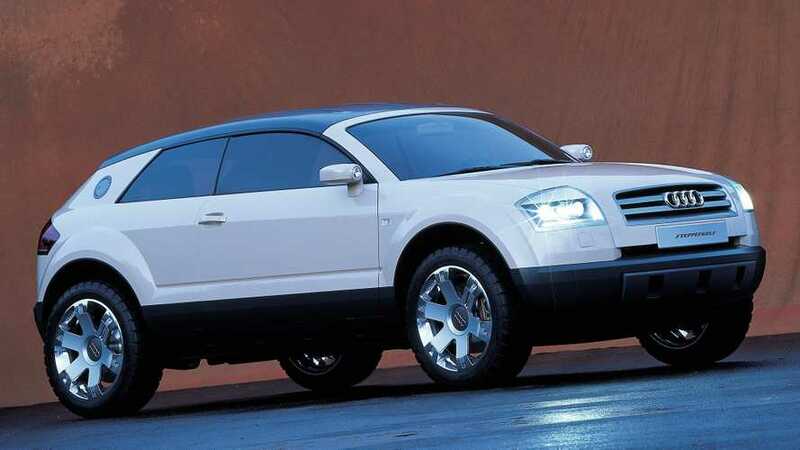 Nearly 20 years ago, Audi first toyed around with the idea of giving the TT a high-riding treatment. Dubbed Steppenwolf, the three-door concept was largely based on the original TT and engineered with both a carbon fiber hardtop and a manually removable fabric roof. Much like the first TT still looks great after so many years, the Steppenwolf remains desirable in our eyes and could be a viable solution for a TT of the future. With standard Quattro, four-level air suspension, and a generous ground clearance, the concept was ready to tackle rough terrain while carrying four people. Envisioned as an all-rounder, the Steppenwolf used a variation of the TT’s interior, which still looks modern even after almost two decades since its debut. The only exception is the small infotainment screen, and we’d probably throw in the Audi Virtual Cockpit to replace the traditional dials of the instrument cluster. 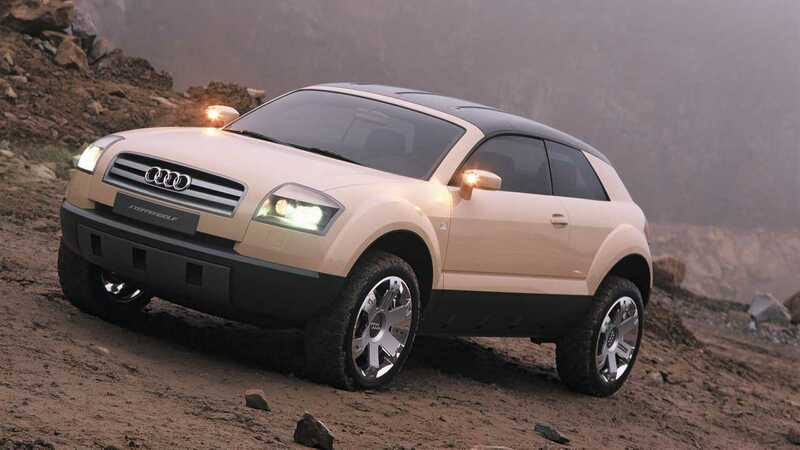 The Steppenwolf wasn’t Audi’s only attempt at transforming the TT into a crossover as the TT Offroad concept (pictured above) from 2014 followed the same idea. Later the same year, a TT Sportback concept was unveiled as a swoopy sedan, but neither of the two made it to production. Attached below is the original press release from September 28, 2000 about the Audi Steppenwolf concept where you can find out all the details. Premiere in Paris: at the Mondial de l'Automobil 2000 (28 September to 15 October ) Audi will be presenting a study for on-road and demanding off-road use. 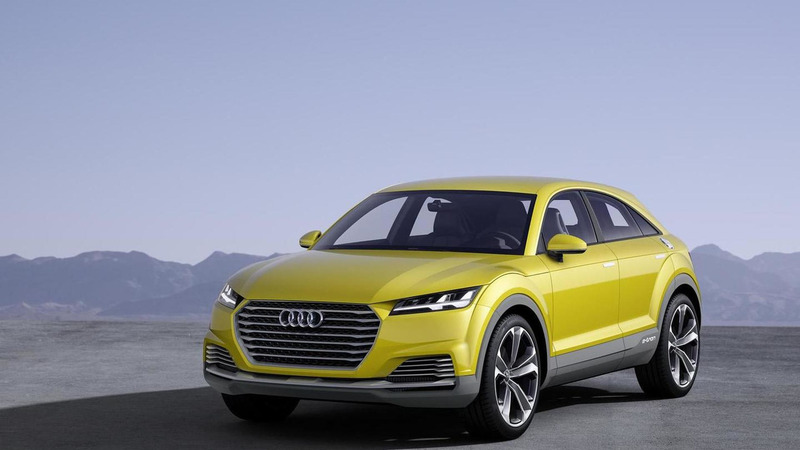 Following the successful launch of the Audi allroad quattro, this concept vehicle now shows how the Audi development engineers visualise a high-performance all-rounder for the compact class. And it embodies a study which represents the consistent evolution of contemporary Audi design. But that's not all: the "Steppenwolf" project - as this three-door four-seater is known - also provides evidence of the kind of "Vorsprung durch Technik" which has long since become synonymous with the name Audi. This study for the compact class also makes use of Audi's quattro expertise and experience with the height-adjustable air suspension. The engineers had set themselves the following goal: the "Steppenwolf" project should be able to master rough terrain in extreme conditions just as effortlessly as high-speed driving. It should feel equally at home in the outback as on the motorway. A free-revving 3.2-litre V6 engine developing 165 kW (225 bhp) accelerates the "Steppenwolf" from 0 to 100 km/h in under eight seconds. Its top speed is well over 230 km/h. Its peak torque of 320 Nm is available across a wide speed range. The manual six-speed gearbox turns this strength into a guarantee of excellent pulling power in every speed range. The quattro permanent four-wheel drive system ensures maximum traction and excellent directional stability in all conditions and in all types of terrain. The electronically controlled Haldex centre differential distributes power between the front and rear wheels. If the front wheels slip, part of the torque is put to the road smoothly via the rear wheels as required. In addition, the Electronic Differential Lock EDL distributes torque between the wheels on one axle. And the Electronic Stability Program ESP helps the driver to remain in control if confronted with potentially critical driving situations at the limit. With its precise rack-and-pinion steering, the "Steppenwolf" can be guided across rough terrain as accurately as it can through fast double bends on the ideal line. The Brembo brake system is clearly visible in the wheels: large, perforated discs and the characteristic red lettering on the callipers with eight pistons point to the system's excellent efficiency. Audi development engineers have come up with an innovative solution for the parking brake, which acts on the rear brake discs. An electronically controlled electrohydraulic system performs the function of the conventional, manually activated handbrake. This enables the lines to the rear brake callipers to be activated via hydraulic valves in such a way that the hydraulic circuit of the foot-operated brake is decoupled. When the driver presses the button for the parking brake in the cockpit, an 80 bar hydraulic pump takes command of the rear brake callipers. A non-return valve blocks the return flow, the rear brakes lock. If the driver presses the control button again, the rear brakes and the foot-operated brake are connected again. To prevent operating errors, the control electronics only allow the parking brake to be activated and deactivated when the ignition is on and the vehicle stationary. The front axle of this four-wheel-drive vehicle has McPherson strut suspension with forged wishbone, cast steel swivel bearings and specially matched axle geometry. The anti-roll bar is connected directly to the suspension strut. The rear suspension uses a longitudinal double-wishbone axle - an extremely space-saving construction which is partially responsible for the particular space efficiency of the "Steppenwolf". The air suspension at front and rear permits a variable ground clearance across a range of 60 millimetres in total. The running gear of the "Steppenwolf" is thus able to produce an extremely low centre of gravity and optimum aerodynamics on asphalt just as effectively as ample ground clearance on rough terrain. Compared with an A3, for example, the "Steppenwolf" offers 102 millimetres more ground clearance in the highest position - which is 223 millimetres off the ground - and an additional 42 millimetres in the lowest position. As on the allroad quattro, the "Steppenwolf" has two control strategies for the air suspension, an automatic and a manual mode. Automatic control is dependent on the vehicle's speed. At speeds of 80 and 130 km/h the system lowers the body in two 20 millimetre stages from the normal to the low level. Correspondingly the body is raised again to the normal level when speed is reduced. By contrast the high level - 20 millimetres above the normal level - has to be selected manually. Once again, however, the vehicle leaves this position automatically if the speedometer indicates more than 35 km/h. All other high levels can also be selected manually at the control panel in the cockpit. Provided no safety-critical speeds are exceeded, the "Steppenwolf" remains at the level selected. The 4-level air suspension not only ensures the appropriate degree of ground clearance, it also has the effect of a load-compensating ride height control system. The level selected is maintained at all times, regardless of the load the vehicle is carrying or even if it is towing a trailer. The air suspension of the "Steppenwolf" has another advantage - a talent for which the Audi allroad quattro's system has already been praised on numerous occasions: it offers what is, not only for off-road vehicles, a unique synthesis of ride comfort on the roughest surfaces together with minimum body movement when cornering at high speed. An excellent basis for ample driving pleasure. Audi development engineers decided on the floor pan with transversally installed front engine as the technical basis for this new model, the same platform used on the Audi A3 and Audi TT. Its length of 4.21 metres and its status as a fully fledged four-seater consequently also reveal the "Steppenwolf" as a representative of the compact class - despite the fact that the visibly wider track and crouched aggressiveness of the body, which is 1.83 metres wide and 1.46 metres high, speak a totally different language. The strikingly flared wheel arches and powerfully dimensioned side sills, the high waistline and the flat curve of the roof sculpt the car's powerful stature. The contrast between the dark roof and sand-coloured body accentuate this dynamic yet elegantly stretched silhouette still further. The "Steppenwolf" makes no secret of its fondness for adventure away from the beaten track. Powerfully contoured bumpers, painted dark grey to contrast with the body colour, demonstrate its off-road destiny just as clearly as the spotlights in the door mirrors. The enormous 19-inch six-star wheels with reinforced transitions between wheel spider and rim are a visual indication of extreme robustness and functionality. The tread pattern of the specially developed 225/50R19 tyres also reflects the versatility of the "Steppenwolf": a tread that is equally well-suited to off-road and on-road driving. The "Steppenwolf" can be fitted with either a carbon-fibre hardtop or a detachable soft top. And it can be driven with the top down: all occupants can then enjoy maximum headroom between the windscreen and tail end. The stable frame is only retained between the C-posts, above the tailgate, in order to sustain the body's high torsional rigidity off-road too. The soft top for the "Steppenwolf" is made of sealed textile fabric and, as on many off-road cars, is fitted by hand. The driver just has to attach two posts above the side windows and snap on the soft top. The design of the "Steppenwolf" is completely new, but every line, every detail shows it to be a member of the Audi model family. The flat radiator grille with the four rings, the sporty, slim silhouette and the high waistline together with the narrow roof area have become almost traditional identifying features of the brand. And the striking wheel arches immediately call to mind the TT, currently the most typical representative of the Audi line. The Audi designers have succeeded in interpreting familiar lines in a new and unusual way, without departing from the Audi design language. Unusual solutions such as the design of the front indicators are harmoniously integrated into the light unit. Surprising solutions can also be found under the bonnet, where the Audi designers' striving for form has once again set clearly visible standards. The six intake pipes of the transverse six-cylinder engine are in brushed metal with a matt finish: a clear, visual indication of this power unit's potential. A "service bridge" located laterally in front of the engine contains all the important openings for topping up oil, coolant and washer fluid, side by side. This engine design combines the design of a classic racing-car inner life and an Audi engine compartment of the future. Another special feature can be found at the back of the Audi design study: a drawer under the luggage compartment edge houses the spare wheel. However, if necessary this moving compartment can also be used with a second insert - in this case the "Steppenwolf" would then carry the Tire Mobility System repair kit with 12-volt compressor and tyre sealing compound instead of the spare wheel. The alternative drawer insert provides space for the optional winch which is engaged with an adapter and can be activated underneath the radiator grille. There is also room in the rear drawer for two running boards which can be attached below the side doors: these provide a useful climbing aid which can be used, for example, to secure luggage to the roof when the air suspension is raised. Anyone taking a step back will recognise the characteristics of the new Audi design in the overall form of the body: wide, clearly contoured lines and large, pure surfaces combine to produce an architecture in which calm and tension are equally present. No superfluous swage lines or curves upset this visual clarity. Function and form become one. The impression conveyed by the interior is also dominated by clear functionality and extreme robustness. All important information is easily legible on large, round analogue instruments with white dials and red needles on a dark background. Predominantly smooth surfaces and the metallic surrounds on displays and control elements convey the same tidy atmosphere of a cockpit. But sobriety is not the only dominant feature: the generous use of "shoe sole leather" on the instrument panel creates an elegant yet pragmatic ambience. There are even cognac beige leather inserts in the footwell, with a black rubber recessed texture to give them a non-slip surface. It is of course no coincidence that this texture matches the striking tread pattern of the tyres. A unique combination of materials which lends a discreet elegance to the interior. An elegance which is in no way detrimental to function and durability: the centimetre-thick sole leather on the floor is sturdy enough for everyday wear and tear, and sufficiently resistant to dirt and moisture. High side sills and the mighty, continuous centre tunnel surround the driver and passengers, producing anatomically correct niches with excellent lateral support. The seats with their pronounced contours are low and mounted on flat consoles so that the occupants assume an almost sports-car-like position, with their legs stretched out. One aspect which is unusual for a coupe is that the "Steppenwolf" offers not only the driver and front passenger, but also the two rear-seat passengers excellent seat comfort with plenty of room for legs and upper body. Rear passengers will be treated to first-class comfort as soon as they climb aboard. The door cut-outs extend a long way back to provide a large opening, and the front seats of the "Steppenwolf" are fitted with the "Easy Entry" mechanism which has already proved a success on the A3. This allows them to be moved right forward, returning to their original position when the backrest is folded back again. The voluminous luggage compartment is also untypical of a coupe. It can be loaded up easily through the side-hinged tailgate which has a window that can be lowered. The rear seats can of course be folded forward individually or together so that the entire area behind the front seats can be used to accommodate bulky sports equipment or even bicycles, for example. When the low-beam headlights are switched on, the inside of the centre console is illuminated in a soft red. The footwell is well-lit when getting in or out of the car. The electronics dim the lighting to a minimum whilst driving to prevent distracting reflections in the front windows. Together with the typical Audi red instrument lighting, this illumination creates the atmosphere of an aircraft cockpit inside the "Steppenwolf", especially in the dark. The driver's right hand only has to reach a short distance from the easy-grip three-spoke leather-rimmed sports steering wheel to the specially designed gear lever. With its matt metal surface and the open gearshift mechanism, it too provides its own individual touch, as indeed do the large rocker switches with wide rubber textured strips on the centre console. The starter button, protected by its own separate flap, is located at the centre of the rocker switch panel. The large, ergonomic rotary switch for the 4-level air suspension on the "Steppenwolf" is also in the centre console. The driver will find the right switch immediately, even in the dark, even wearing gloves; operation of the controls never produces any unwelcome surprises. The navigation system Plus with large LCD monitor is perfectly integrated into the smooth centre console. The presence of this instrument in the off-roader's cockpit would appear to make even more sense than in other vehicles; it makes the driver's work easier and leaves him free to concentrate on his most important task. The GPS aerial of the navigation system is integrated out of sight in the rear roll bar. The large centre console is not only highly functional, it also houses a cooler box. This is ideal for keeping drinks in, and will by no means only come in handy if embarking on a trek across the desert. There is no lack of storage space in the "Steppenwolf" for all those everyday items needed in the car. Besides a large glove box there are particularly practical storage compartments in the high side sills which secure their contents with a net. This will put an end to maps etc. falling out of the door pockets when the doors are opened. Generous seat pockets attached to the back of the front seats can be removed: the most important items can thus be stowed here and taken out of the car if an off-road expedition is continued on foot, for example. Something which has come to be expected in an Audi can also be found in the "Steppenwolf": a BOSE sound system with CD player. A total of nine speakers produce a listening experience which will satisfy even the most sophisticated of demands. The "Steppenwolf" is an all-rounder. Just like its legendary ancestors, the Audi quattro and Sport quattro, it offers the technology of a rally sports car - on both asphalt and gravel tracks. It unites the indisputable authenticity of a driving machine with the advanced elegance of Audi design. A car that extends horizons, whose potential allows experiences beyond the realms of apparent possibility. A precision tool for the way through even uncertain terrain.